What is Radiant Heat Resistant Clothing? The clothing types which are used to protect the human body from radiant heat are termed as radiant heat protective clothing. 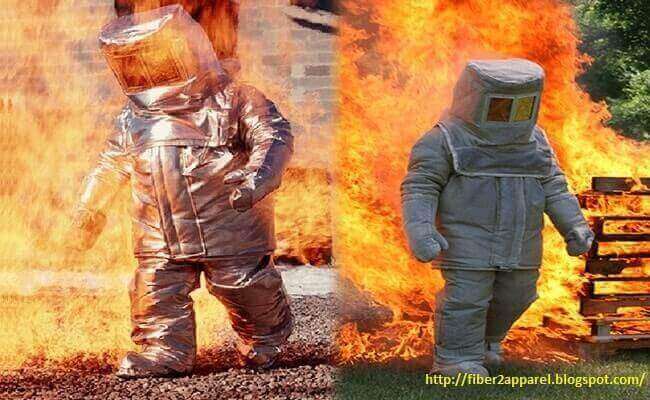 The special type of protective clothing is necessary to protect the human body from radiant heat. A lot of radiant heat protective apparel or clothing in the market but among those, aluminized finished radiant heat-protective clothing is considered as the best one. A radiant head protective capability of the apparel is more reliant on the aluminized finishing. Smooth aluminized finished heat resistant or heat protective clothing radiates more light and heat than other kinds of finished fabrics. As a result, its radiant heat protective capability is better. If the smoothness of the aluminized finished clothing is reduced or the clothing surface becomes dirty the radiant heat protection capacity of aluminized finished clothing is reduced. Hence, aluminized finished clothing is again finished with the special type of resin coating very lightly. As a result, increases abrasion resistance power of the clothing, soilless and easily cleaned. Temperature generation on the surface of the aluminized finished fabric is half of the other type of finished clothing at still air when aluminized finished clothing is subjected to radiant heat together with another type of radiant heat-resistant clothing. It is experimentally proved. Temperature generation on aluminized finished clothing is further reduced in case of running air. Fabric density is also related to radiant heat resistant property beside the method of aluminized finish. Lower destiny fabric shows better radiant heat resistant property than higher density fabric. Keeping the fabric weight, fiber composition and aluminized finishing method constant and only varying fabric density. It’s because lower density fabric contains more trapped air than higher density fabric. The thermal productivity of trapped (still) air is lower. Hence, lower density fabric shows better performance in the radiant heat. Aluminized finished apparel shows poor convective heat resistant characteristic but good radiant heat resistant characteristic. If radiant heat resistant apparel comes in contact to flame, as in case of a firefighter clothing is not so good, but as clothing for a furnace, man is good. Aluminized finished apparel fabric structure is also related with radiant heat protective characteristic. The fabric may be knitted, woven or felted. Needle felted fabric shows better radiant heat resistant characteristic. Radiant heat and conductive heat can easily pass through the trapped still air inside those fabrics in case of knitted and woven fabric, but the fibers in the fabric are arranged in a scattered way in case of felted fabrics. As a result, radiant and conductive heat cannot easily pass through. Presence of moisture in the radiant heat protective clothing has also relation with radiant heat protective characteristic. The radiant heat protective performance is reduced in presence of moisture increases in the radiant heat resistant clothing or apparel.